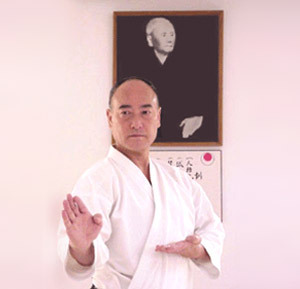 Abe Sensei has also taught and influenced some of the top Japanese instructors in the world today, and headed numerous delegations in around 50 countries for the JSKA and the Japanese government. Abe Sensei is also one of the few Karate-ka to have refereed in the presence of the Emperor of Japan during a Japan National Tournament. This is indeed a great honour in Japan and only highly respected Karate-ka might ever attain such a level of recognition. Abe Sensei has a great understanding of Karate history and philosophy through the formation and development of Shotokan style into what he perceives the future has to offer: “I feel that today’s Karate is centered only on winning competitions and everyone trains towards this end. But this is very far from the true purpose of Karate. I believe that the true purpose of Karate lies in daily training with a goal to develop in parallel a strong body and mind and furthermore to contribute to society in general; the Karate-do we practice has for essential purpose to attain a correct control of body and mind”. Abe Sensei established the JSKA to realize what he himself sees as the true purpose of Karate.